It’s worth it to splurge on a new pair of shoes or a set of good knives if you know they'll last forever—or if they don't, that their maker will repair or replace them for free. Here’s a round-up of seven useful everyday items that come with a manufacturer's lifetime guarantee. We know that $340 seems like a steep price to pay for a 5 ½ quart Dutch Oven. However, plenty of cooking enthusiasts are willing to shell out top dollar for iconic French cookware manufacturer Le Creuset’s enamel cast-iron pots, casserole dishes, and skillets. The colorful kitchen tools are attractive and durable, plus they distribute heat evenly. An added bonus? Each item comes with a lifetime limited warranty. 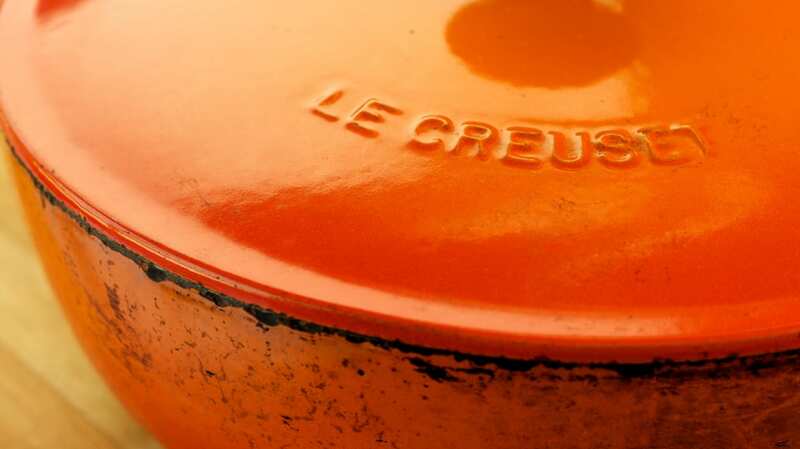 "Defective cookware will be replaced free of charge, or replaced by a similar product or one of equivalent value if the product is no longer in production," Le Creuset’s website states. Of course, you can’t just swap your grandmother’s ancient Le Creuset casserole dish (or the one you bought on eBay) for a new model if it chips or breaks. You have to be the item’s original owner. The warranty also "does not cover damage from abuse, commercial use or other non-consumer use, neglect, abnormal wear or tear, overheating, or any use not in accordance with the cookware instructions provided with the utensil." In other words, it needs to be obvious that the cookware has worn down with consistent use (and that you didn't accidentally scorch it in a kitchen fire). We’re not endorsing smoking, but portable butane lighters can be useful if you’re camping and need a quick and easy fire source. Plus, many people find flicking a lighter’s tiny switch to be less intimidating than lighting a match. If you do plan on purchasing a lighter for household or outdoor use, make it a Zippo. Founded in 1932, the iconic company’s trademarked slogan is “It works or we fix it free." No matter how old or damaged your pocket lighter, you can ship it to Zippo. They’ll promptly repair or replace it—but keep in mind that this warranty only extends to real Zippos, and not toward counterfeit lighters. (Factories in China reportedly make around 12 million fake Zippos a year.) Wondering if you own the real thing? The Wall Street Journal produced a handy video back in 2011 that teaches you how to distinguish a genuine Zippo from a fake. Get one of Zippo's genuine Windproof Lighters on Amazon for $10 and up. If the trusty JanSport backpack you purchased in high school is starting to look a little threadbare, you can send it—or for that matter, any one of the brand’s packs, bags, or luggage items—back to its warranty center in Alameda, California. Depending on the damage, JanSport will repair it, replace it, or refund it. Repairs will take anywhere from four to six weeks, depending on the season, and while you pay the initial shipping charges, JanSport absorbs the bag’s return costs. However, JanSport doesn’t claim responsibility for “direct, incidental or consequential damages." Your pack's wear and tear should stem from good old-fashioned use—not because, say, it got shredded by a luggage carousel. Stores take Craftsman's warranty pretty seriously. In 2009, Consumer Reports’s website, the Consumerist, wrote that a California man was refused a full warranty when he visited Sears and tried to trade in some of his grandfather’s old Craftsman tools. (At the time, Craftsman was controlled by Sears Holdings, though it has since been acquired by Stanley Black & Decker.) The man was reportedly denied replacements because some of the tools had rusty sockets. He sent an angry letter to Sears, and one of the corporation’s vice presidents, David Figler, replied by issuing a statement to the Consumerist: "Craftsman tools have a heritage of performance and trust,” Figler wrote. “I want to assure you and your readers we stand behind the warranty—complete satisfaction—period.” He assured the website that he had communicated with Sears's sale associates to rectify the error. Check out Craftsman's products at Amazon, Lowes, or Sears. You can get the 193-piece Craftsman mechanic's tool set above for $111 on Amazon. Founded in 2010, HARDENCO (also known as Hartford Denim Co.) is a small, old-school clothing manufacturer in Connecticut that produces raw denim jeans. Made by hand on antique sewing machines, they're designed to last forever. However, since all jeans rip and fray, the company's clothing also comes with a lifetime of free repairs. (On their website, the company. explains that it gets the chance to “improve our work and get to know our customers a little better" by mending your pants gratis.) And if you own a pair of worn jeans that weren't made by HARDENCO, they'll still fix them up for you for a charge. The company's classic jeans are $285. Cutco knives have a “Forever Guarantee” that allows owners to send their blades to the company’s headquarters in Olean, New York, for free sharpening or repair—forever. (You have to pay for return shipping, though.) If you’re still not satisfied with your knife, Cutco will replace it, no receipt or registration required. And if you do damage your Cutco knife through misuse or abuse (meaning, essentially, that it’s your fault the product’s damaged), Cutco will still replace the item for half of its current sales price, along with sales tax. Find Cutco knives on Amazon or on the Cutco website. If you own a pair of L.L. Bean boots, chances are they’ve outlasted every other pair of footwear in your closet. The durable rubber-and-leather shoes are hand-stitched in the company’s Brunswick, Maine factory. They’re designed to survive every single camping trip, rainy day, or hiking excursion—but if they don’t, L.L. Bean will let you trade them in for a new pair, no questions asked, for up to a year. In fact, this policy extends to every single store purchase. "We stand behind all our products and are confident that they will perform as designed," the company writes on its website. Up until early 2018, L.L. Bean's famously generous return policy—which didn't even require a receipt—was good for the entire lifetime of the company's products. Apparently, enough unscrupulous customers abused the program (buying items from garage sales and then returning them for full credit, for instance) that it cost the company as much as $250 million in one five-year period. As a result, the no-questions-asked lifetime guarantee now only applies to products purchased before 2018. However, when it comes to product defects, L.L. Bean is still true to its original policy. If you bring a product in that has a defect or has broken down due to poor craftsmanship, the company will still consider it for a return regardless of the purchase date. Shop the company's beloved boots for men, women, and children here.